The Peachtree Playthings Website can be found here. Route21 has no affiliation with Peachtree Playthings and can not supply info on anything besides stompers(shifters). 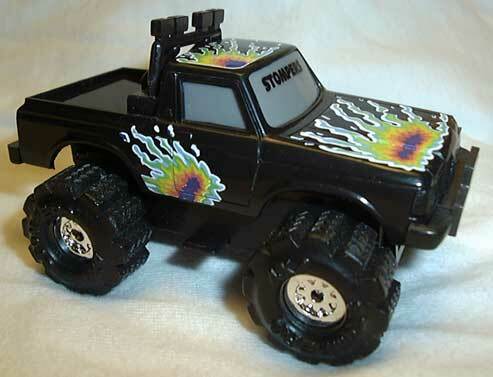 In 1997, Peachtree Playthings, an Atlanta, GA based company, resurrected the Stompers. Winner's Circle was the first new one I got. 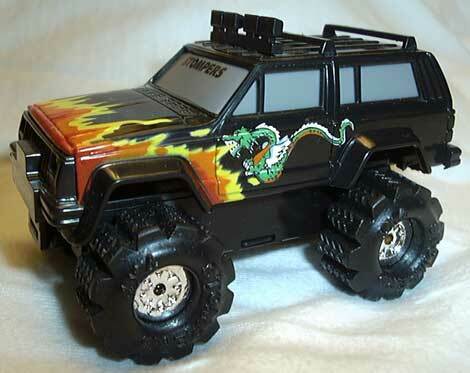 The 1997 set consists of five other vehicles, Road Kill (purple), Surf Runner (white w/ blue or red waves), Splash Down, Dune Hopper, & Fire Breather ( black or blue). You can see all six by looking on the back of the package. 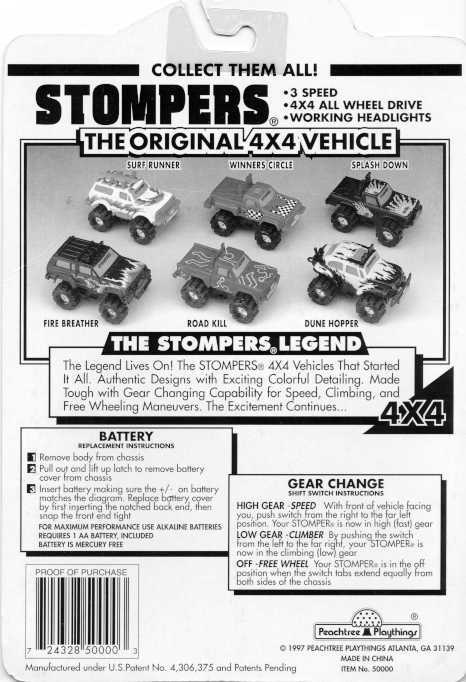 This set has an almost identical base to those of the second generation of the original stompers. 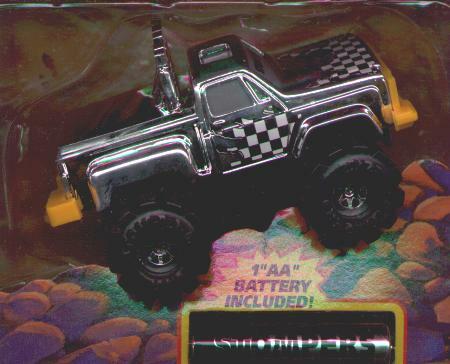 Even the batteries say stomper on them. Click here for a close up of the front logo. 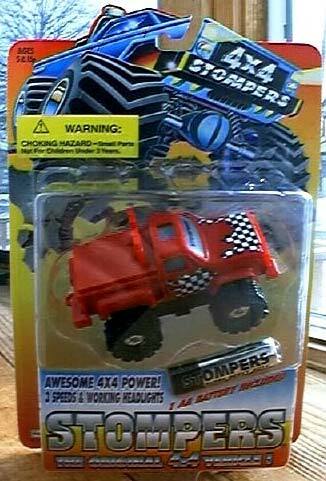 In 1998, Peachtree Playthings has released more sets of stompers in updated packaging. They have also rereleased the earlier set but have added a few more color combinations, in particular, Click here to see a Road Kill that is a red truck with white figures on it and a Winner's Circle that is now a yellow truck. A bigger change has been seen in Splash Down, which has new designs and is now called Yellow Thunder. 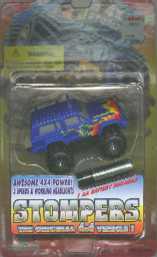 They've also added 6 more to the 4x4 collection with these stompers which includes the Buzz Saw (Subaru), Shockwave (Chevy Blazer), Beach Patrol (Jeep Wrangler), Fast Forward (Dodge Ram), Flame Thrower (Truck), and Yellow Jacket (Ford Merkur). 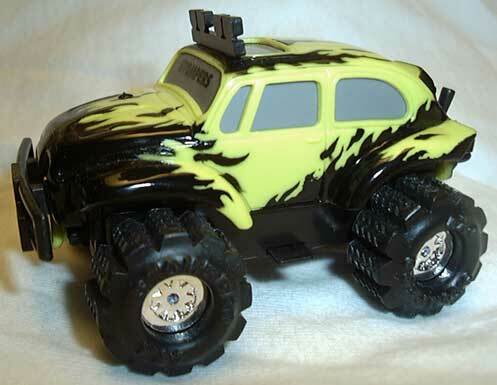 Also keep your eyes open for special a chrome Yellow Thunder stomper. The first new set is the Work Force and is based on the old 'Work x 4's'. This includes a front end loader, a utility truck, a cement mixer, a bulldozer, and a dump truck. All of them are yellow except the utility truck which is white. The second new set is Battle Ready and is based on the old 'Mobile Force'. This includes a troop carrier, an ambulance, an armored jeep, and an armored attack vehicle. This set comes in both a light and a dark camoflage. The third new set is X-Treme Street. This set includes Street Jet, Nitro Burner, Thrill Ride, Shark Bite, Custom Coupe, and Draggin' Wagon (Red & Purple). The tires are harder (but still somewhat squishy), wider, and flatter than the conventional tire. Peachtree Playthings also released three playsets, Danger Crossing, Battle Canyon, and Excavation Site. Each one comes with two stompers and the actual playset. They seem to have come out in late 1997/early 1998. On top of everything else, Peachtree Playthings has also brought back water demons! There are two styles: one with a big open trunk and another that has a detachable boat on a flatbed. Each style comes in two different color combinations. 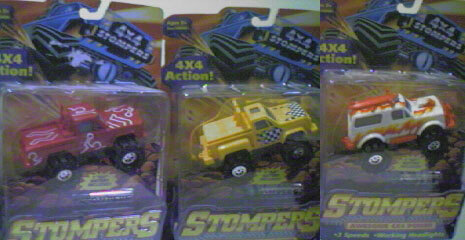 Three new action 4x4 stompers have been spotted in late Nov '99. 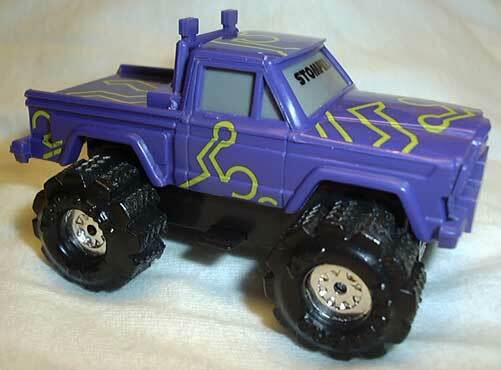 There is a chrome Winner's circle, Big Rig which is a red truck, and an Extreme bug which is the Dune Hopper body but it is painted purple and has the word 'extreme' painted on yellow on the hood. unfortunately, it could not last forever. Peachtree has given up on the official stomper and moved on to "SHIFTERS" in 2000. Shifters are copycat stompers that are the same length, but are about a 1/4" wider. 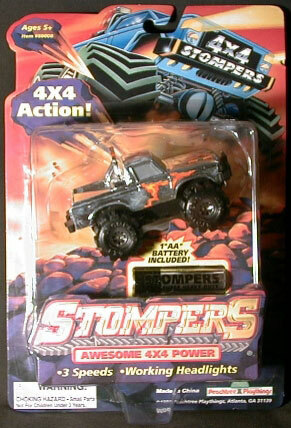 They are not as well designed as stompers, except for the fact that you can put them in two wheel drive mode. 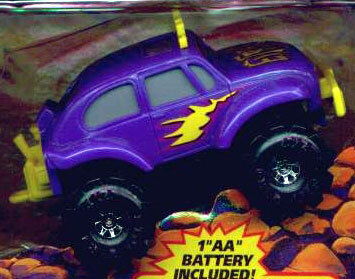 They came out as a set of 12 and are officially licensed by Ford and Chevy. There are 3 body styles, a Chevy blazer with 3 paint schemes, a Chevy Silverado (Z71) with 3 paint schemes, and a Ford F-150 with *6* paint schemes. Peachtree did not even take the time to redesign the packaging. 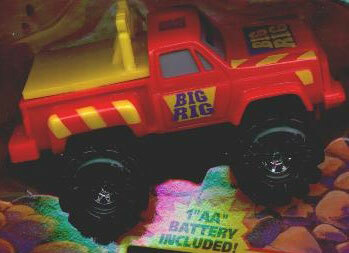 One mini playset is also available: Rockin� Ridge Playset.